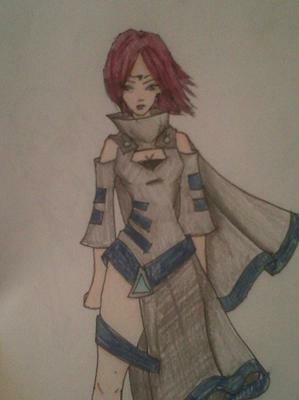 This is an original character design as well as clothing! I love just how it looks so sci-fi-ish! I think I may use this in a story! She looks more like a mage than a warrior, maybe if you put more armor or something on the shoulders or legs it would look like a light armor warrior. no offense its great looking!. Join in and write your own page! It's easy to do. How? Simply click here to return to Pencil Drawing Contest.